What could any ghost want from me?" I don't think I'd like it if a ghost wanted something from me. that's a good question! and a great answer! nice teaser! I keep trying decide if I want to read this. I will have to come back and check out your review. I'd never thought of it this way. I wonder what the ghost wants?! Love it. I love the name Phin! Excellent teaser! 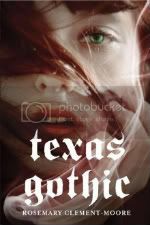 Sounds like a book I should check out - I love a good ghost story, especially Texas ghosts! Here's my teaser from Along Came a Spider. Ooh very interesting! Love me a good ghost book! I have been looking forward to reading this one. I am anxious to see your thoughts on it. I read this one recently - loved it! I just got this one yesterday! Hope you will stop by and comment on my Clockwork Prince teaser on http://EmmaMichaels.Blogspot.com ! Whoa, GREAT teaser. Immediately makes me wish I was reading that book. Come on over to my blog to check out mine!